Do you crave comfort foods when the weather turns cooler? 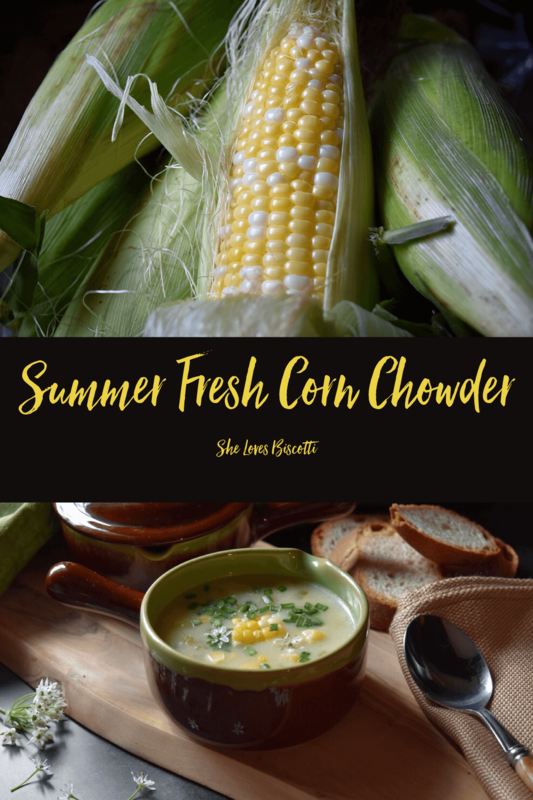 The transition from summer to fall is a little bit easier with food for the soul recipes like this Summer Fresh Corn Potato Chowder. In fact, the end of summer is the perfect time of the year to make this Summer Fresh Corn Potato Chowder. 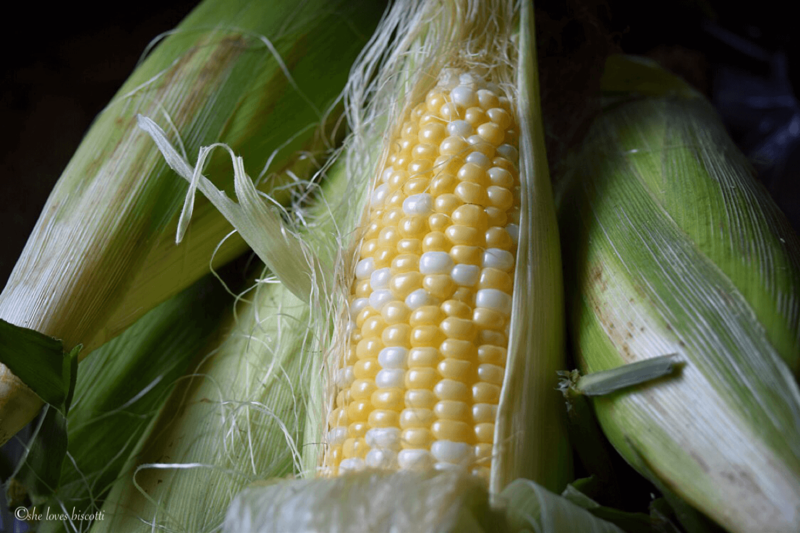 Local farmers’ markets are still in full swing so there is still plenty of time to make recipes using farm fresh, flavorful sweet corn. Another favorite of mine is the combination of squash and pear, also easily available at this time of the year. If interested, just click on the following link for the recipe for Roasted Butternut Squash Ginger Pear Soup. There is no denying that the freshness of the corn is what makes this chowder taste absolutely amazing. Also, remember to check the ends of the cob (were it was attached to the plant). It should not be brown or discolored. Ideally, corn on the cob should be cooked the same day it is picked. That’s because the corn sugars start converting into starch as soon as they are removed from the plant -which means that the corn becomes less sweet. Farmers’ markets and roadside vegetable stands will usually sell farm fresh corn. If you are not able to cook the corn the day it is purchased, place them in a plastic bag in their husks and refrigerate immediately. Try to cook them within 24 hours. There will be no refrigerating of corn today because we are making some soul food. 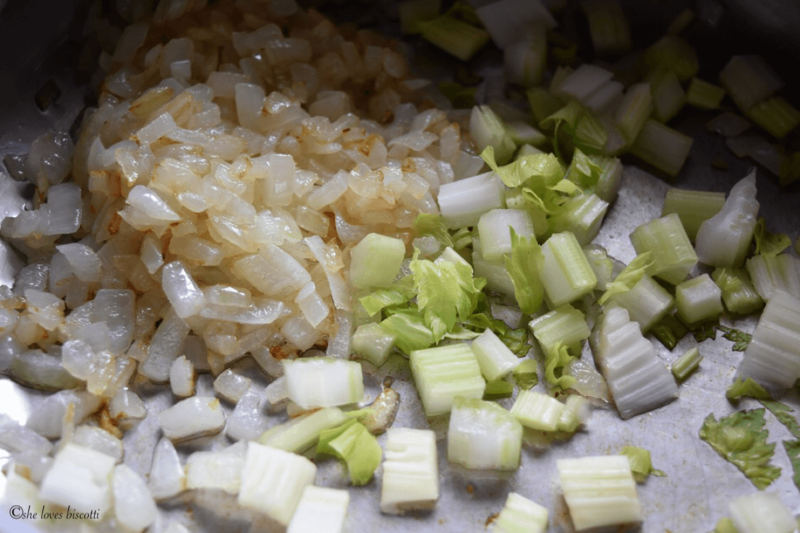 Let’s begin by chopping up the vegetables… onions, celery and of course potatoes. Drizzle a couple of tablespoons of vegetable oil and sauté the onions. Stir frequently for about 10 minutes or until they begin to soften. While the onions are sweating away, let’s get started on the corn. By this time, the onions should be translucent. Add the celery and minced garlic and sauté for another minute or so. Next, stir in the flour and cook for about a minute. Please note that for a gluten free option, you can completely eliminate the flour. The addition of the cubed and grated potato will thicken the soup. As an alternative, you can always use cornstarch. Add the vegetable stock, the diced and grated potato and bay leaf. Reduce heat and simmer for about 10 minutes or until potatoes are tender. Add the blanched corn kernels and milk and heat through for about 3 – 4 minutes. Discard the bay leaf and season to taste with salt and pepper. Just before serving, garnish with fresh chopped chives and some grated cheddar cheese. I also like to garnish with some chive blossoms. My husband loves to top his corn chowder with some pickled hot peppers. In what feels like another lifetime (almost 25 years ago) this recipe for Summer Fresh Corn Potato Chowder would be the soup that was made to celebrate “harvest season” in one of the retirement homes I used worked for. The original recipe was standardized for two hundred portions. For over twenty years, when that sweet summer corn makes an appearance in farmers’ markets, this has been my go-to soup. Needless to say, I scaled down the recipe and have adapted it to my personal preference. 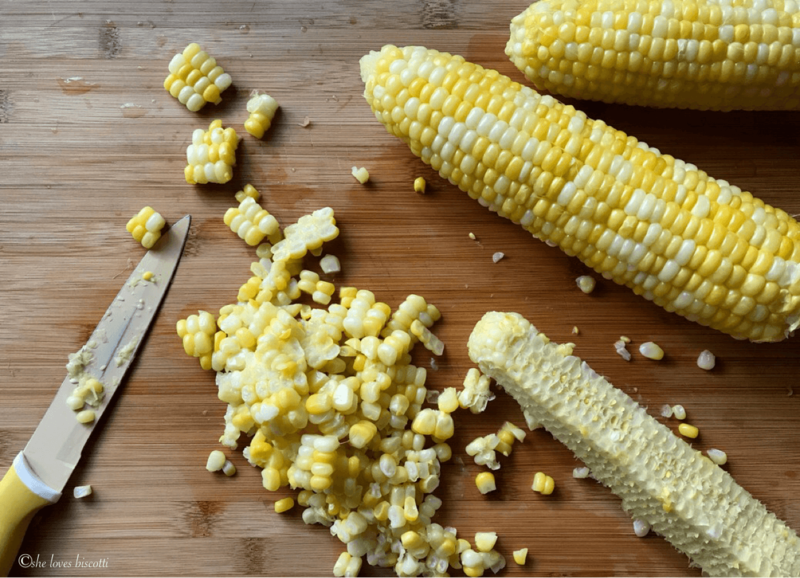 Although the recipe can be made with frozen or even canned corn, there truly is no comparison as far as taste is concerned when summer fresh corn is used. 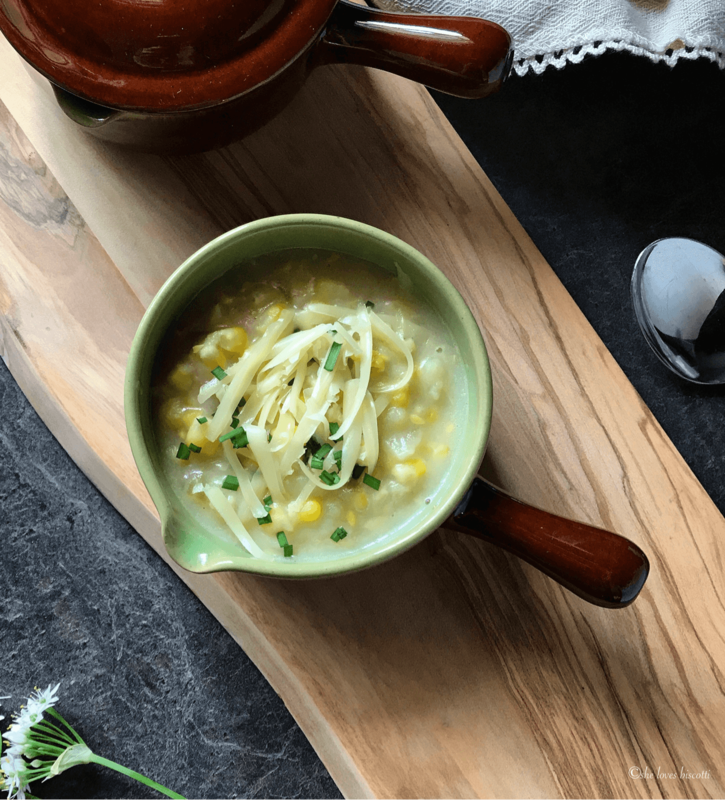 The transition from summer to fall is a little easier with a bowl of comfort food like this recipe for a Summer Fresh Corn Potato Chowder. Place a large, thick bottomed pot over medium heat. Sauté onions while stirring frequently for about 10 minutes or until they begin to soften. Add the celery and minced garlic and sauté for about a minute. Stir in the flour and cook for another minute or so. Add the corn and milk and heat through for about 3 - 4 minutes. Just before serving garnish with fresh chopped chives and grated cheddar cheese. 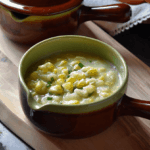 DO YOU LOVE THIS CORN POTATO CHOWDER RECIPE? PIN IT TO YOUR SOUP BOARD! This looks like a super creamy soup… can’t wait to try it! What a fantastic summer chowder – all of the comfort of the traditional winter chowders yet full of summer goodness!